* In the body, estrogens are metabolized to form 2-hydroxyestrone metabolites (2-OHE) and 16alpha-hydroxyestrone metabolites (16alpha-OHE). These are considered weak and strong estrogens, respectively. The latter of these can have undesirable cellular effects if an appropriate balance is not maintained. Cytochrome P450 is a phase I detoxifying enzyme complex in the liver that supports healthy estrogen metabolism and has been shown to promote the production of 2-OHE. Indole-3-carbinol (I3C), naturally found in vegetables including broccoli, brussels sprouts and cabbage, induces cytochrome P450 and phase I detoxification enzymes and also supports phase II detoxification enzymes. A double blind, placebo-controlled study involving 60 women supplementing with indole- 3-carbinol suggested a favorable shift in estrogen metabolism. Additional clinical trials involving human volunteers demonstrate that I3C has the ability to promote healthy 2- OHE and 16alpha-OHE metabolism, providing a potential mechanism for breast health support. In an in vitro study conducted at the University of California at Berkeley, I3C supported healthy cellular enzyme function. This maintained healthy cellular metabolism in a culture of human breast cells. Furthermore, a placebo-controlled trial indicated that I3C supports cervical cell health as a result of healthy estrogen balance. By enhancing cytochrome P450 enzymes and others, including glutathione-s- transferase, I3C has also been shown to support various tissues and to scavenge free radicals. In recent years, I3C has shown a promising ability to support prostate cell metabolism. In the stomach, I3C is converted to various active metabolites, most notably diindolylmethane (DIM), believed to be responsible for the health benefits associated with I3C. 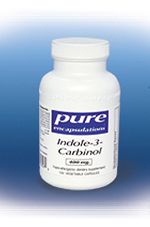 Indole-3-carbinol, the powerful phytochemical found in cruciferous vegetables, provides breast, cervical and prostate cell support by activating detoxification enzymes, promoting healthy estrogen balance and cellular metabolism, and scavenging free radicals. REFERENCE: Sarkar FH, Rahman KM, Li Y. Bax translocation to mitochondria is an important event in inducing apoptotic cell death by indole-3-carbinol (I3C) treatment of breast cancer cells. J Nutr 2003 Jul;133(7 Suppl):2434S-2439S.